After a hectic waiting list movement period, I got a confirmation mail from IIM Kashipur. I was so excited to finally study in a B school. With some luggage, I started my journey from Delhi’s Anand Vihar terminal. After traveling for 5 hours and crossing two famous rivers of northern plains i.e. Ganges and Yamuna, I finally reached Kashipur. It is a small city located at the foothills of Great Himalayas. Kashipur is located in district Udham Singh Nagar of Uttarakhand state which is also popularly called “Devbhoomi” for the number of temples it has and their significance. The city is located around 240 km northeast of New Delhi which can be easily traveled by cab, bus and train. The campus of IIM Kashipur is located at the outskirts of the city and is surrounded by lush green fields and trees. Its proximity to raw nature allows it to have cool fresh air throughout the day and clear twinkling stars at night. 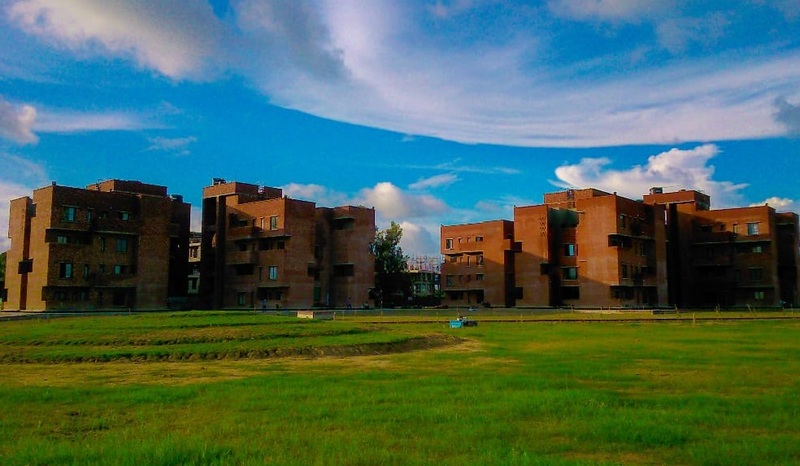 After its establishment in 2011, IIM Kashipur finally moved to its new campus in 2016. It is a world-class facility spreaded over 200 acres. It has a Gyan Tal surrounded by some beautifully designed buildings such as Bodhimata administrative block, Vihara academic block and Chaitya library. Hostels too are high class with single occupancy rooms and high-speed wi-fi and other facilities. Dining area gives a decent view of lush green campus and beautiful buildings through its glass walls. All over it is a decent place to spend two years of your life. IIM Kashipur is an institute which is driven by mission to drive academic excellence using innovative teaching methods, promoting research and practice of sustainable leadership. It is located in one of the most densely industrialized regions in the country with over 180 industries having plants in and around the region. This places the Institute at a vantage point when it comes to ‘Learning by Doing’ via frequent industry interactions and live projects. IIM Kashipur believes in a strong industry connect and has invested in developing relationships with local industries. For all adventure loving people, IIM Kashipur is in close proximity of Jim Corbett National Park and is a drive away from tourist hub of Nainital. Staying here provides you with ample opportunities to visit these places and feed your adrenaline hunger. You can join our biking groups or can go for solo and group trekking. Finally, it is not the environment, buildings and nearby places which create a campus. It is people living there. IIM Kashipur has students from every corner of India allowing you to feel that diversity of cultures, languages, festivals, and religions. It is a learning ground where you get to see different perspectives of life. With the pursuit of excellence, transparency, lifelong learning, integrity and mutual respect as its core values IIM Kashipur campus is developing leaders who can perform globally. If you are a part of this beautiful journey, I congratulate you and hope that you become your best. If you are not, I welcome you. Ideally, I do not want to constrict myself to work in a particular company. I want to push myself through different job roles while exploring new opportunities and facing new challenges. Even though if I am allowed to choose my first company, I would like to join Aditya Birla Science and Technology Company Private Limited. My choice is supported by my prior education and experience in material science R&D. Firstly, I believe my knowledge of R&D operations and systems will help me in understanding this firm better and I will be able to start delivering much earlier. Secondly, I liked the zeal of ABG group for in-house R&D and I would love being part of that team.